We are looking for a river ecologist to join the NGRREC team. This a full time research position, and represents an excellent opportunity for an early to mid-career scientist to establish their own laboratory focused on high-impact research on the ecology of large rivers. You can read more about the position here. All inquiries should be directed to search committee chair Dr. Anthony Dell (adell@lc.edu). We seek an outstanding undergraduate student for a paid internship through the NGRREC summer internship program (www.ngrrec.org/internship). Using state-of-the-art experimental methods that include video and automated tracking, the intern will conduct laboratory experiments to measure how changes to water temperature affect the schooling behavior of juvenile Asian carp. For general questions about the intern program at NGRREC contact Intern Program Coordinator, Natalie Marioni at ngrrecintern@lc.edu. You can read more about our specific project on thermal effects on fish schooling (Project #5) here. Questions about the specific project should contact one of the project mentors: Dr Anthony Dell (www.dellecologylab.org); Dr Andrew Berdahl (https://fish.uw.edu/faculty/andrew-berdahl/), and Dr Jason Knouft (http://knouftlab.weebly.com/). All applications are due via online submission by midnight January 23, 2019. In this paper we explore how the size of experimental arenas can modulate the shape of the functional response, primarily due to behavioral mechanisms associated with thigmotaxis (a tendency to seek physical contact with objects such as arena edges). You can find a pdf of this paper on our PUBLICATIONS page. Unlike the circular arenas, annular arenas produced similar foraging rates and space clearance rate estimates across arena sizes, confirming that it is the increased density of prey along edges that generates the previously observed arena size effect. Our results provide a key insight into how animal behavior and experimental design must be considered for the accurate interpretation of foraging rates, both when considering standalone functional responses and when making comparisons across experiments. In this paper we introduce the Alliance for Freshwater Life, a global initiative, uniting specialists in research, data synthesis, conservation, education and outreach, and policymaking. This expert network aims to provide the critical mass required for the effective representation of freshwater biodiversity at policy meetings, to develop solutions balancing the needs of development and conservation, and to better convey the important role freshwater ecosystems play in human well‐being. Through this united effort we hope to reverse this tide of loss and decline in freshwater biodiversity. You can find a pdf of this paper on our PUBLICATIONS page. Check out our new paper on “Using Camera Traps to Assess Mammal and Bird Assemblages in a Midwestern Forest“. The paper includes two undergraduate interns (David and Laura), and was led by postdoc Carl Cloyed. You can find a pdf of this paper on our PUBLICATIONS page. We designed a camera-trap setup that enabled us to capture images of both large and small animals and used our camera-trap design to investigate the community composition of mammals and birds and to estimate the biomass of mammals along two transects in a conservation reserve in Missouri. Great to see Van Savage and Samraat Pawar again - first time together in a long time! GRC Unifying Ecology Across Scales is easily one of the favorite conferences - great to see friends old and new. Check out our new paper on “The complex drivers of thermal acclimation and breadth in ectotherms”. In it we combine simulation modeling with analysis of published data on thermal acclimation and breadth (range of temperatures over which organisms perform well) to develop a framework for predicting thermal plasticity across taxa, latitudes, body sizes, traits, habitats and methodological factors. You can find a pdf of this paper on our PUBLICATIONS page. Super fun and productive visit to NGRREC by Dr Claire Gwinnett, an Associate Professor at Staffordshire University in the UK. Claire works within forensic science, particularly the analysis of trace evidence such as plastic fibres. Claire gave some very useful advise to our interns about methods for processing microplastics, and a fantastic seminar. Look forward to working with Claire and her group going forward! Do microplastics move through aquatic food webs? Our current NGRREC intern Nick Wells is undertaking his second (yes second!) experiment during his NGRREC summer internship. Nicks experiment is exploring if microplastics move from the environment (sediment) to deposit feeders (chironomid larvae) to predators (dragonfly larvae). Can we retrieve microplastics from our river and insect samples? Britt and Tony just back from a fun and productive week with Dr John Delong at the University of Nebraska’s Cedar Point Biological Station in north-eastern Nebraska. We are working with John and his lab on the behavioral underpinnings of interference competition in wolf spiders. This was our second trip to Cedar Point, which we plan to be an annual adventure. Looking forward to seeing what the tracking results show! Spent the morning on the Mississippi River sampling for microplastics, both in the main water column and sediment. Great visit by Kasey Folwer-Finn and her lab from SLU to talk science and possible fronts for collaboration, and to hear a great talk by her postdoc Daniel Sasson. Just back from a great few days with Dr Andrew Berdahl (collective behavior) and Dr. Jeff Kerby (drone scientist extraordinaire) at The Nature Conservancy's Dunn Ranch Prarie in North-Western Missouri. Dunn Ranch is home to about 200 bison that roam around a restored section of the Central Tallgrass Prairie Ecoregion. We are using emerging drone technology and the unique ecosystem of Dunn Ranch to explore the collective movement of bison across the ranch, and its dependence on spatio-temporal patterns in vegetation and management practices. Welcome to the lab Nick Wells, our NGRREC summer intern who will be researching plastic pollution in river ecosystems. Just arrived back from our National Geographic funded expedition to Moorea, French Polynesia. Almost three weeks of research with postdoc John Grady and phd student Ash Olson. Using the marine and terrestrial ecosystems of Moorea (arguably the best studied ecosystems on Earth) we used remote video to quantify the behavior, movement, and interactions of a diverse range of terrestrial and marine species. This work represents what we think is the first ever effort to quantify how animals, from tiny invertebrates to large vertebrates, move, behave and interact both within and across ecosystems. Thanks to the Gump staff for hosting, and to National Geographic for funding! Britt is new staff in the lab, and comes to us from the University of Arkansas where she was postdoc-ing. As well as helping to oversee the smooth running of our lab (and the lab of Dr. John Crawford), Britt will be conducting her own research, which explores how population and community structure interact with the environment to affect dispersal. Britt combines theory from animal behavior and population biology with experiments, field studies, and robust quantitative approaches to mechanistically understand the process of dispersal and predict the resulting patterns of population dynamics and gene flow. Her research primarily focuses on amphibians and damselflies (Hexapoda: Zygoptera), two groups of animals found throughout many aquatic ecosystems. A new collaborative paper of ours just out about how ‘Managing consequences of climate-driven species redistribution requires integration of ecology, conservation and social science’. In the paper we review recent progress, key gaps and strategic directions in this nascent research area, emphasizing emerging themes in species redistribution biology, the importance of understanding underlying drivers and the need to anticipate novel outcomes of changes in species ranges. You can find a pdf of this paper on our PUBLICATIONS page. Check out a new collaborative review paper on “Collective animal navigation and migratory culture: from theoretical models to empirical evidence”, which stemmed from a workshop at the Santa Fe Institue on “Collective animal motion in the wild”, organized by Andrew Berdahl and Colin Torney. 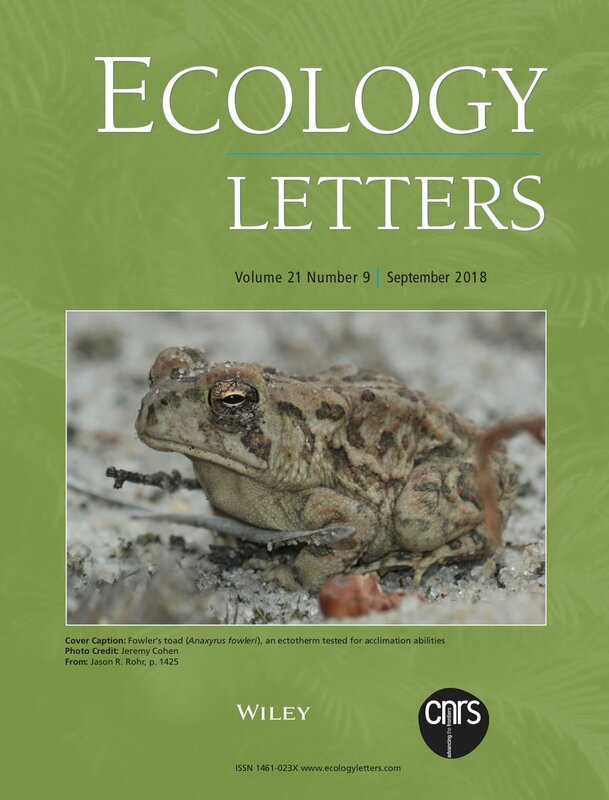 This paper is part of a species issue on ‘Collective movement ecology’ compiled and edited by Andrew M. Berdahl, Dora Biro, Peter A.H. Westley and Colin J. Torney. You can find a pdf of this paper on our PUBLICATIONS page.